Can you imagine waking up one day sick and never getting better? Can you imagine that happening shortly after getting married and having a toddler? For me that became a reality. 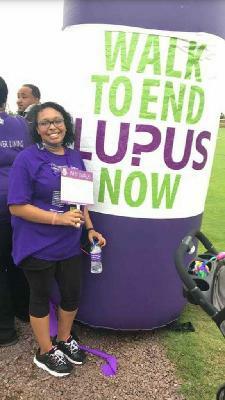 :) Hi I'm Demi & this year will mark my 3 year anniversary of being diagnosed with Lupus, and the 2nd walk I've attended. If you don't know what Lupus is, don't worry-- I didn't either at first. But to put it simply, Lupus is an autoimmune disorder where my body sees itself as a virus & therefore attacks it frequently. There are different types of Lupus and my particular one is Lupus Nephritis, and my body has attacked my kidneys. It's incredibly difficult to diagnose as every person is different, and many symptoms mimic those of other illnesses. the awareness for Lupus is unbelievably low. But it gets worse, currently there is no cure. Just lots of medicine combinations that reduce the symptoms so you can continue to live "a normal-ish life". That's why I'm taking action in the fight against lupus, and I'm asking you to join me. By either making a donation of any amount, seriously every single dollar helps improve the lives of all of us with Lupus. Or if you're up to it, actually joining me at the walk. What's more, if your employer offers a Matching Gift Program to employees, you may be able to double your contribution with just a little bit of paperwork.